If you’ve been following me for awhile you know that pink is my favourite colour, so I’ve invited a few bloggy friends to do some pink guest posts. 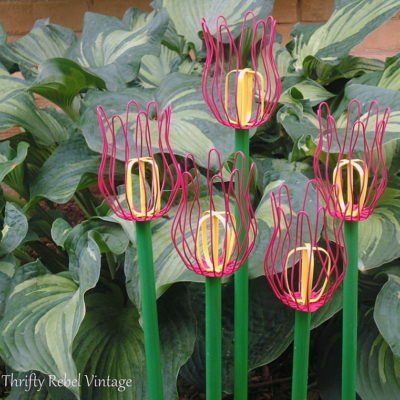 Let’s just call them the Pink Ladies. Pink is the word… is the word… that you heard. It’s got groove… it’s got meaning.This week’s Pink Lady is Linda from A La Carte. I love Pink and when Tuula asked me join in with the Pink Ladies, I was thrilled and honored! I love thrifty finds and the thrill of the hunt! I shop at vintage shops, yard sales, thrift shops and I have attended the World’s Longest Yard Sale for several years. This shelf was found at a thrift shop and hung in my bedroom that is done in (what else) PINK! 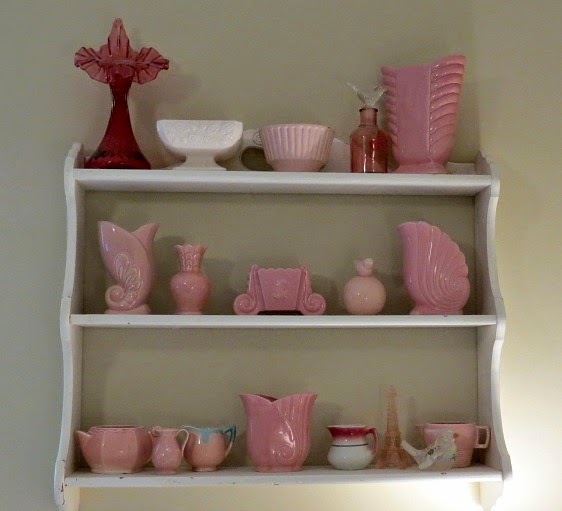 I put not only my pink pottery on these shelves and some other favorite pink things! 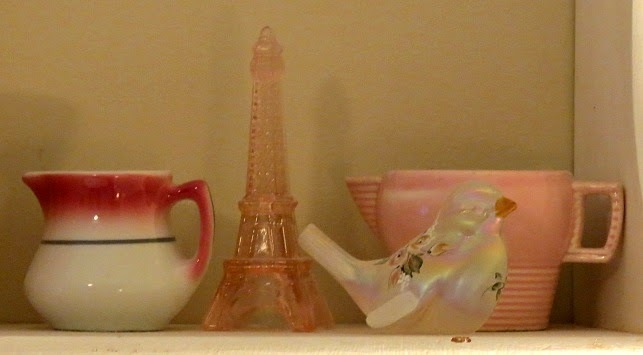 I love all things Parisienne and this pink Eiffel Tower was found at a yard sale. The lovely hand painted bird was a gift from a blogging friend Chris. I also love creamers and if they are pink, that makes them even better! I inherited this lovely piece from my friend Gypsy! The pottery planter with the ‘L’ on it started this collection. I found it at the WLYS a few years ago! This McCoy piece is one of my favorites! It is pale pink and the flowers are gorgeous! It was purchased at the WLYS also for a bargain price! So thank you Tuula for inviting me to share my love of pink with all of your readers! is wonderful. I’m going to have to find me one of those. The McCoy piece is absolutely beautiful. Thanks so much for sharing your pink treasures, and thanks for joining the Pink Ladies. 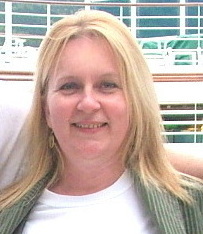 If you don’t know Linda you should really pop over and visit her blog A La Carte. As you can tell by this post she loves thrifting, but she also shares art projects, decorating, her travels, and more. like so much the last one! 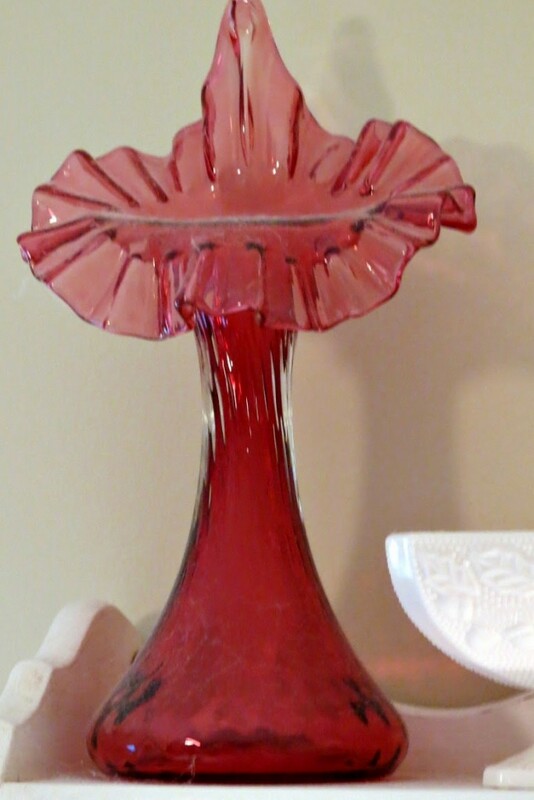 Hi Tuula, how pretty is Linda's pink glass collection. I love pink too! Have a wonderful day ladies. Fun to meet Linda and see her all of her pretty pinkness. I love that pink Eiffel Tower! 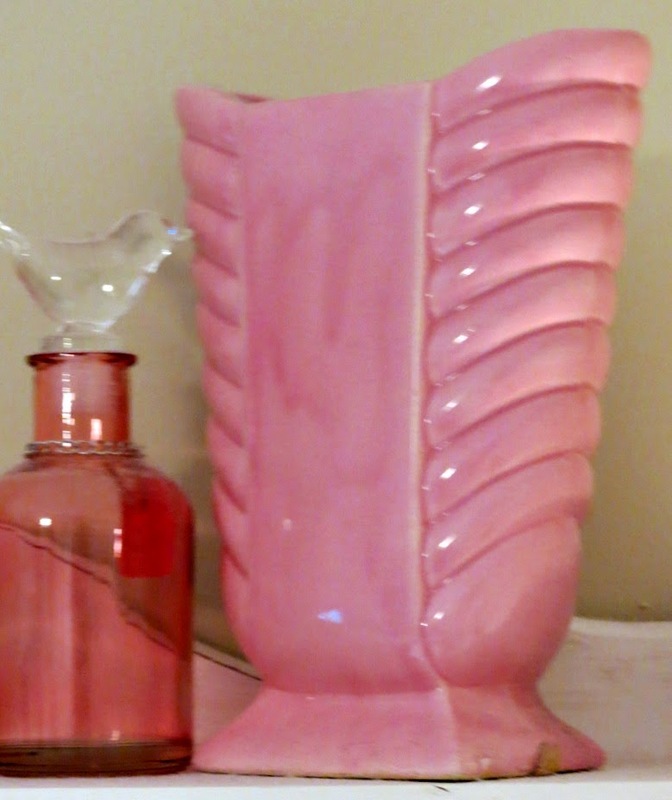 Tuula, you may have found a pink soul mate for your thrifting! I've enjoyed meeting Linda and her beautiful pink collection and I clicked on her blog and loved reading about the ending of a friendship. Very inspirational in so many ways! Thanks for joining the Pink Ladies, Linda! Good morning, Tuula! Thank you for introducing us to Linda 🙂 Her pink delights are simply beautiful! Enjoy your week, my dear. Hugs! Welcome, Linda, to the Pink Ladies Club! 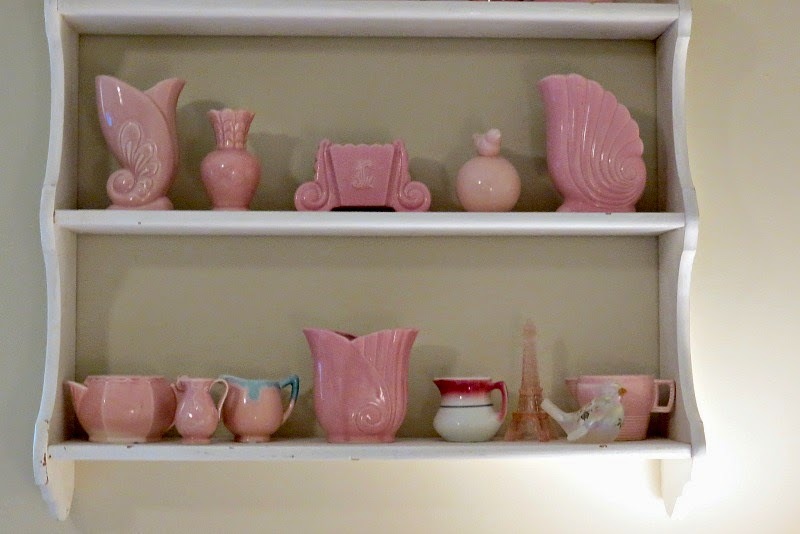 Luscious pink pottery collection. I knew there had to be an Eiffel Tower in there. Thanks, Tuula, for bringing Linda over to Think Pink! I love Linda and her pink collection is fabulous! I always look forward to what pink treasures and crafts are being shared on Mondays! Have a happy week ladies! Thanks for inviting me to share my Pink Pottery today. I am proud to be a Pink Lady! 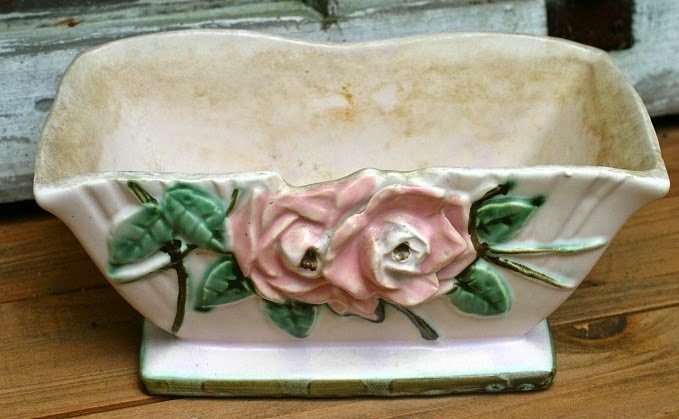 I think grouping all her pink pottery together, as Linda has, is stunning. I've always wished I had enough of a collection to do something like this. And I've so want to go to the WLYS one of these years. I can only imagine what a dream come true that would be for most of us. So nice to have Linda join the Pink Ladies!! Now I can't get that song out of my head! 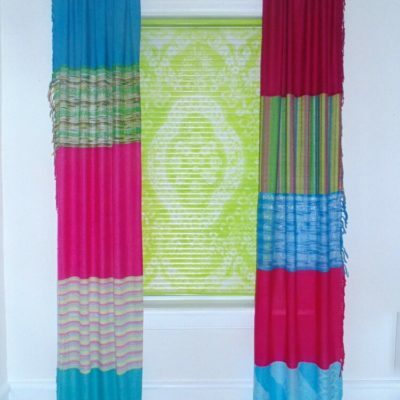 Linda's collections are so pretty, and she's grouped them in such a way that it really brings out the best in them. Pretty in pink! I've never seen pink pottery. Love this collection! Welcome to the pink ladies club Linda!